Due to start sales this summer, the new Focus will be able to sense when a wheel is falling into a pothole and adjust the suspension to limit how far the wheel drops; this reduces the impact when the wheels hit the other side of the pothole and smooths out the ride. 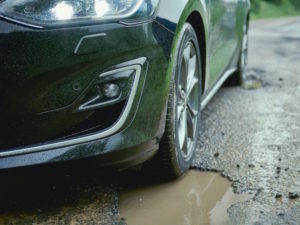 Data published recently by the RAC showed the percentage of breakdowns likely caused by potholes and poor roads doubled in the first quarter; the organisation also warned that it expected to see more vehicles suffering pothole damage in the second quarter of 2018 compared with recent years. Ford’s new technology forms part of the optional Continuously Controlled Damping, which monitors inputs to aid ride quality, and has been tested on a specially created road at the company’s test facility in Belgium as well as on a wide range of European public roads.